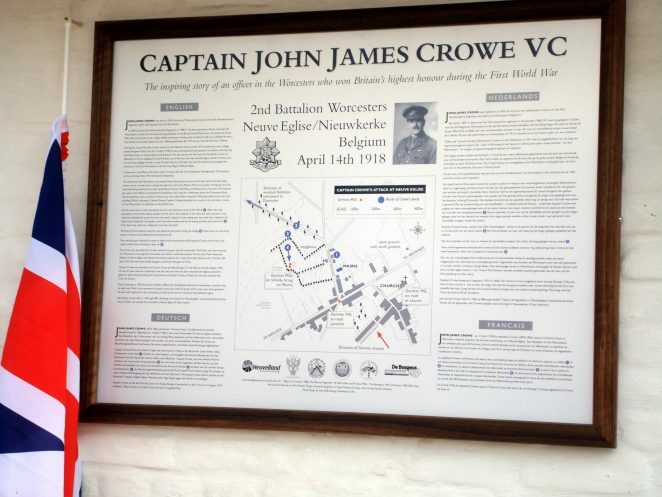 At the unveiling of the plaque dedicated to the memory of Captain John James Crowe V.C on the 16th of April 2011 in Nieuwkerke, formerly Neuve Eglise, my sister Andrea and I recalled some of our personal memories of Granddad in our speeches. Granddad had a motorbike and side car and travelled from Woodingdean to Portslade to visit once a week throughout the war. Granddad brought us a rabbit and sometimes some eggs as he had some ducks in his back garden. In the summer he would dig the vegetable patch in our back garden. Andrea and I would run around the garden holding a seed tray with soil in it and our ‘pet’ worm before returning it to the ground later in the day. “Loverly tell your mum” was Granddads’ favourite phrase. We took a keen interest in raising money for the Red Cross by giving concerts in the garage and raffling Granddad’s prize vegetables. When I started secondary school I was pleased to tell Granddad I was learning to play hockey. As we were walking along a pavement at the time, he stopped and showed me how to hold an imaginary hockey stick and move my wrists to control an imaginary ball. He had regularly played hockey in the army. Granddad loved his dogs; he had spaniels for years they went rabbiting with him. He also in later years had a mongrel called ‘Binty’. One day Binty fell and hurt one of his legs very badly. Granddad sat up all night watching over Binty. We had moved to Woodingdean to be nearer Granddad and visited him the next morning. Granddad was sitting in his armchair with Binty in his basket beside him. I am glad to say that Binty slowly recovered. Granddad was on the committees for the British Legion and the Happy Circle in Woodingdean. He made the buttonhole posies for the ladies using flowers from his garden. He also enjoyed visits with friends to watch Douglas Reeve play the organ at the Dome. The last time I saw him he was going to hospital to have an operation. “I need to get through this then I shall be alright”, I kissed his forehead and said “You’ll be alright Granddad you’ll be alright” Andrea and I admired him and loved him dearly.